More than 400,000 people have used an app that analyses the information they have put on Facebook. The app, by Wolfram Alpha, shows Facebook users their account activity in the form of pie charts, graphs and maps. 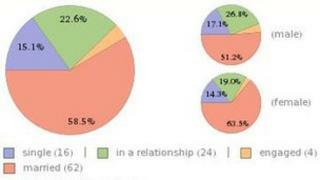 Pie charts reveal the ratio of their friends' relationship statuses and maps plot their locations by global city. If the user has included their date of birth the app will also tell them what the weather was like that day. Wolfram Alpha works directly from data already online to provide a definitive answer to a question rather than providing links to other websites like a traditional search engine. British physicist Stephen Wolfram came up with the idea. In a blog post he described the function of the app as "personal analytics for Facebook". "I've no doubt that one day pretty much everyone will routinely be doing all sorts of personal analytics on a mountain of data that they collect about themselves," he wrote. "I think I could spend ages doing it. And coming back at different times to see what's changed." The platform also reveals a user's most popular posts and generates a word cloud in which the most frequently used words are displayed the largest. Users can choose to clip and share their graphs on various social networks including both Facebook and Twitter. The report can be generated by typing "Facebook report" into the Wolfram Alpha search box.